Many of the man-made ponds for storing toxic sludge from coal-fired power plants have dangerously weak walls because of poor construction methods, according to the synopsis of a study for the Office of Surface Mining Reclamation and Enforcement obtained by The Washington Post. OSM engineers became concerned that embankment construction quality control may be inconsistent when they observed cases of material being placed under wet conditions,, excessive lift thickness, and consultants recording passing test results when visual observations (pumping and rutting) indicate the material may not be adequately compacted. Results of the testing tend to indicate that the coarse refuse is not consistently being compacted in accordance with approved specifications. Failing field density tests occurred at all seven of the sites investigated. Of 73 field density tests performed at the seven sites, only 16 yielded passing results. These results indicate the quality control methods used during embankment construction may not be achieving the desired results. Prior to publishing, results of this study will be compared with those of a similar study, currently being performed by the WVDEP. The OSM and WVDEP studies will be completed in the future. In late 2011, OSM turned down my Freedom of Information Act request for the raw test result data. The agency also turned down requests from citizen groups for that same data. OSM determined that the data gathered was not sufficient to fully answer the question and make a determination. OSM is now gathering additional data and asking other government agencies to evaluate both the methods and results. West Virginia regulators have not adequately examined the risks that coal-slurry impoundments across the state could break into adjacent underground mine workings and cause a disaster like the one more than a decade ago in Martin County, Ky.
For more on that story, read Coal Tattoo posts here and here. Is the location of the seven sites known to the general public? Do ‘we’ have access to this information? 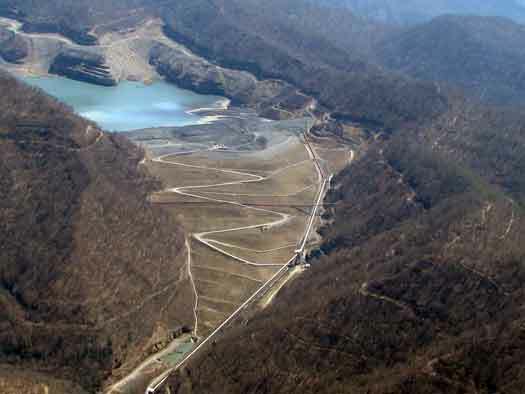 It seems almost unbelievable to me that DEP regulators permitted a surface mine – with regular blasting taking place – right next to the Brushy Fork impoundment pictured above. Just plain common sense should dictate that major blasting should not take place near a huge dam – whether or not the dam material is adequately compacted. Don’t worry. When one breaks, wiping out small towns and killing a bunch of people, the coal operators will just call it an “act of God” and continue business as usual. This entire situation with the OSM documents is alarming. What is OSM hiding by not making these documents public? What is the truth about these coal dams’ safety? There seems to be plenty of reason for the grave concerns of the citizens and groups. Is it any wonder? Imagine, more than 20 peer reviewed scientific studies, published in reputable sources, have been COMPLETELY ignored by our state government. I guess they all feel, as do many coal operators, that people’s lives are merely a “cost of doing business”. The precautionary approach used by real scientists states if an action or policy has a suspected risk of causing harm to the public or to the environment, in the absence of scientific consensus that the action or policy is harmful, the burden of proof that it is not harmful falls on those taking an act. Thanks for the valuable information. It is time that OSM investigates the horrors of coal mining and the toxic coal slurry impoundments. I wish OSM would delete from their home page that coal was essential for national security. This misinformation on their web site seems to glorify and to promote coal at any costs or harm to communities. It really upsets me that more and more coal is exported while the pollution remains. Illinois has committed itself to fossil fuels, instead of renewable energy. Coal and gas operators have moved in and are given the red carpet. The concept that coal is essential for the Nation’s energy security is what I should have said in my prior statement. The U S will never transition off coal with the idea that national survival is dependent on it.